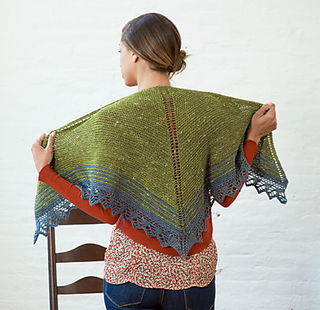 This beautiful triangular shawl features a garter stitch body, a striped border and aspen leaf lace edging. The end result is the perfect accessory for a crisp autumn day. GAUGE: 15 sts + 34 rows = 4” (10 cm) in Garter st, after blocking. NEEDLES: 1 - 24” US 8 (5 mm) circular needle. SIZE: 60” wingspan, 24” deep, after blocking. Thanks to Rozanne from Naples for alerting us to this little bit of errata! BODY: Work rows 1 + 2 of Body Pattern 50 times - 209 sts. 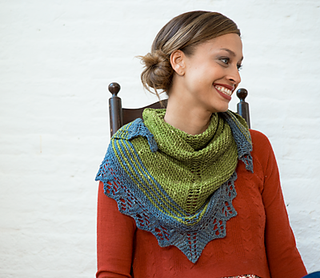 Next Row: K3, slm, k to m, yo, slm, k1, slm, yo, knit to m, slm, k3 - 211 sts. Next Row: Knit all sts. Then continue onto the Border.